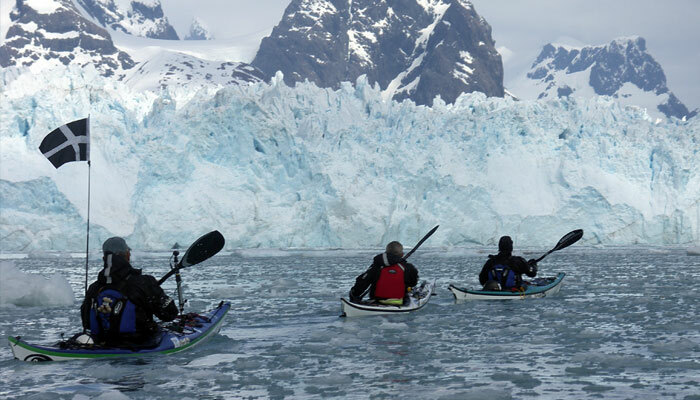 Patagonia, the Antarctic Peninsula and the sub Antarctic island of South Georgia are now firmly embedded in the psyche of serious kayakers looking for exotic destinations. 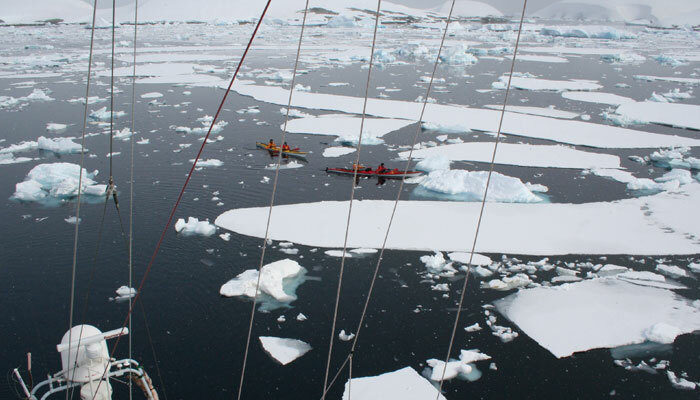 There have been several kayak expeditions to the Antarctic Peninsula during the last five years and in October and November of 2005 two separate teams made the first and second circumnavigations of South Georgia, long considered to be the Holy Grail of kayak expeditioning. 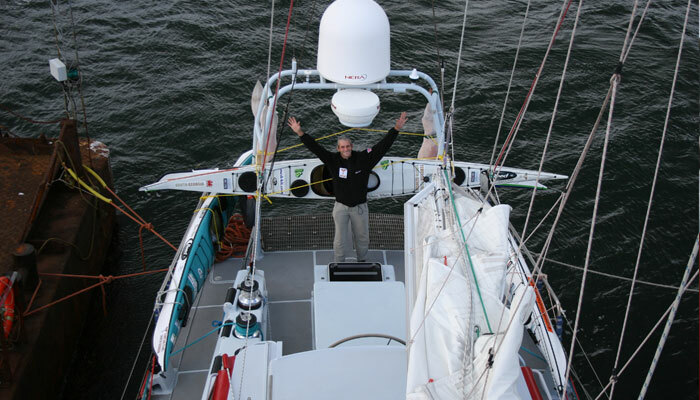 In October Graham Charles and team from New Zealand made the first full circumnavigation in 18 days (go www.adventurephilosophy.com ). Three weeks later Pelagic Australis supported Peter Bray’s British Expedition in November where they beat that time making it in an astounding 13 days. Operation S. Georgia kayak expedition Click image above for 2.8mb flash presentation (allow time to download) of the circumnavigation. 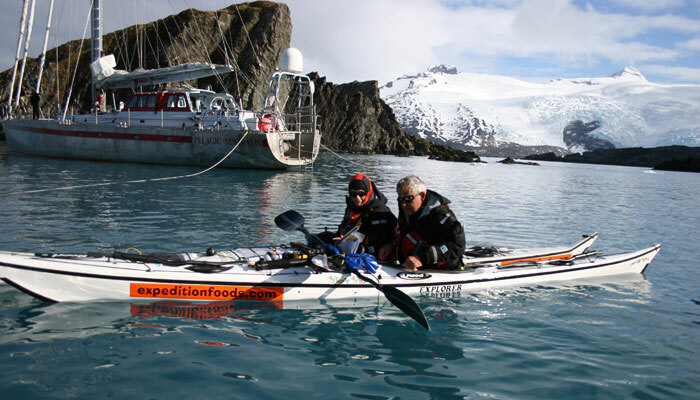 Based on supporting what is considered to be an extreme kayaking experience, Pelagic Expeditions is offering this service to other teams. 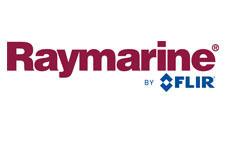 Our current knowledge of the coastline and specific beach landings and also the systems we have developed for handling the kayaks during offshore deployment and recovery operations would enhance any team’s chance of success and enjoyment. Currently, a support vessel is required by the Chilean authorities for the Cape Horn islands but not for the inner channels of Tierra del Fuego, where in fact most expeditions could be safely self supporting. 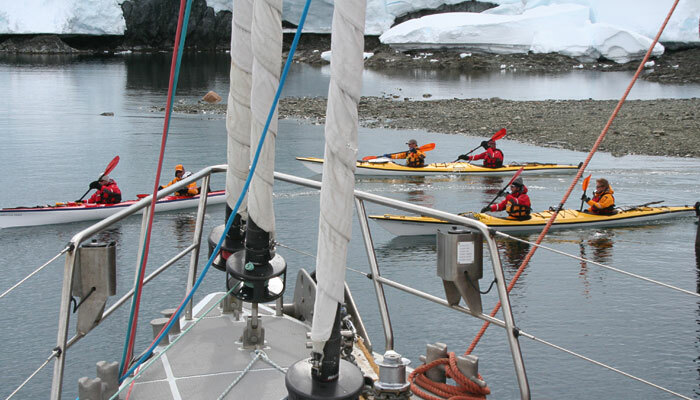 However, we would be interested in working with any expedition requiring a ‘base camp’ to follow in their wake. 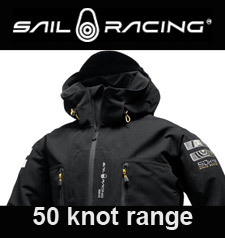 This would provide a certain level of comfort for the team and also ultimate safety. 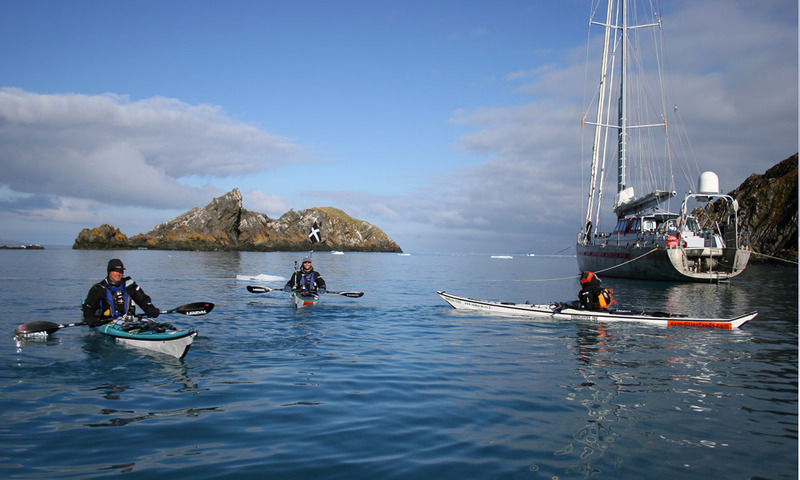 The islands of Cape Horn and Tierra del Fuego are a kayaker’s paradise with low risk. October to April is the optimum period. Embarkation could be in Ushuaia, Puerto Williams or Punta Arenas. The scope is limitless for an adventure that could last a few weeks or up to two months. The ideal time with regards climate and navigation would be mid December to mid March. Embarkation would be in Puerto Williams or Ushuaia. A complete north south traverse of the Peninsula from the Trinity Peninsula down to Marguerite Bay (about 450 nautical miles) is the ultimate adventure. Pelagic Australis could stand by to re-supply either at arms length, or follow close by for ultimate safety and/or filming support. 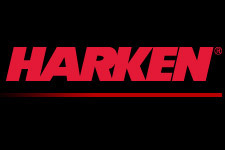 Shorter voyages can be made in specific areas of interest. 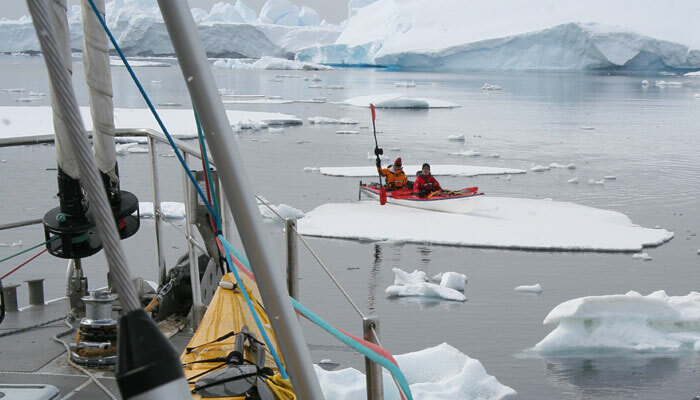 Due to requirements within the Antarctic Protocol, every expedition must apply for permission from its national Antarctic program and this is now a legal requirement within national legislations of member countries. 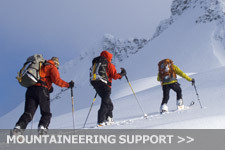 In the case of an American expedition application is made with the National Science Foundation’s Antarctic program; with a British expedition with the Antarctic section of the UK Foreign Office. 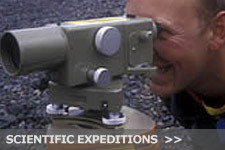 Full details of the team members, their expedition experience, their equipment and communications, safety and contingency plans must be documented. An environmental assessment must also be made with regards their understanding of restrictions and rules regarding the flora and fauna and also their systems for waste disposal. 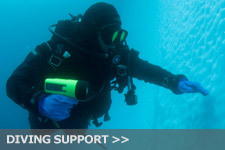 Pelagic Expeditions can brief the team and assist with this application process. 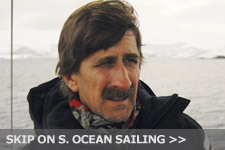 Pelagic Expeditions must also apply for its own vessel permit with the British Foreign Office. October is early in the year with regards temperatures, but the problems of fur seals on the beaches are at a minimum during this period. Early November has a more mild climate, but on November 27th give or take a few days, the fur seals haul out on the beaches to pup en mass and beyond this date until the end of January the beaches would be generally too dangerous to land on. After the end of January is again optimum and the month of February is mild. For a full circumnavigation attempt (roughly 250 nautical miles), a five to six week charter, beginning and ending in Stanley is recommended. If only a traverse of the north coast is planned the charter time can be reduced to 28 days. 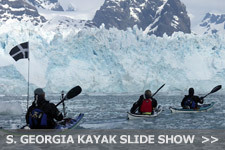 Every adventure expedition (climbing, kayaking, trekking) that goes to South Georgia is required to be self sufficient in mode of transport to and from the island and have a support vessel dedicated to its activities during its time on the island. 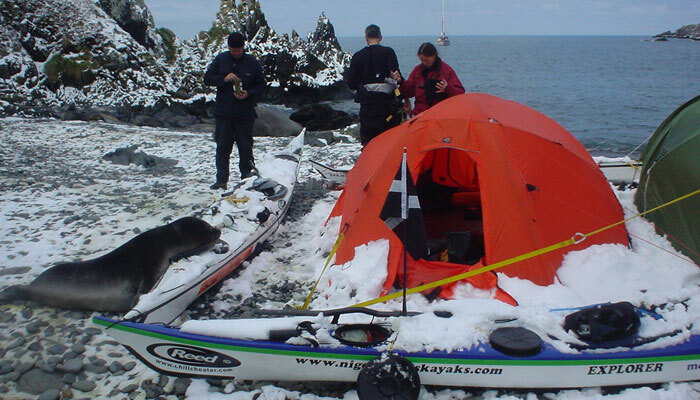 If the team plans on camping ashore, the expedition must also apply to the government for permission. This application process is vetted by a panel of South Georgia experts who will look at their experience, overall planning and contingencies and of course their awareness of environmental protocols that are particular to the island. They then make a recommendation to government to approve or deny the permission. A fee of 500 GBP is paid on application and a further 500 GBP paid if the application is successful, the first instalment being non refundable if the application is denied. 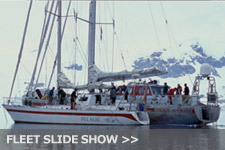 Pelagic Expeditions can assist in the application process. Again, Pelagic Expeditions must apply to the government of South Georgia for her vessel permit. 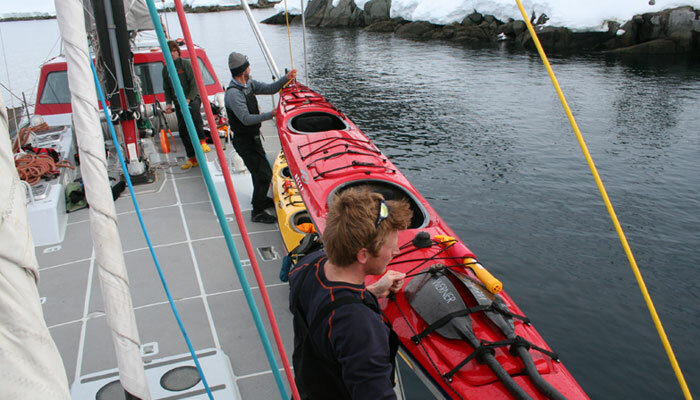 Pelagic Australis can easily embark up to six 17 foot sea kayaks safely to the Antarctic or South Georgia as deck cargo. While on location she would be a powerful support vessel in the event of emergency recovery in high wind and sea conditions. 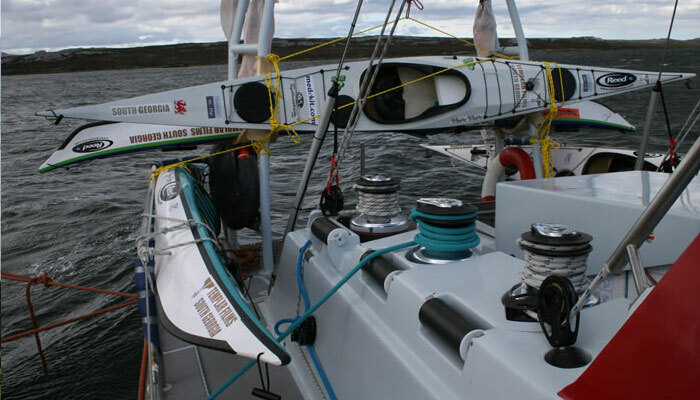 With her in-house Inmarsat satellite equipment, she would also be the ultimate media platform for filming and picture transmission in the case of sponsored expeditions. Pelagic, by contrast is a cost effective alternative, with some limitations. 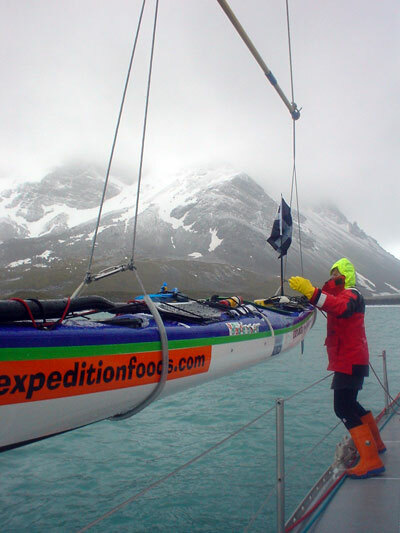 She could carry, but not guarantee the safety of the kayaks to and from South Georgia and the Antarctic. Possibly a safer method would be to have them shipped down via cruise ship by prior arrangement. Pelagic also does not have the transmission capability of Pelagic Australis. In effect she is more suited for private, low profile expeditions, but is more than capable of getting the job done once on location. To be kept fully informed of the application process with any government authority for permissions with copies made available on demand. 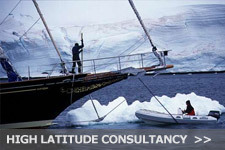 Any expedition applications fees will be borne by the expedition and not by Pelagic Expeditions. A minimum of three paddlers. We will not embark teams of only two due to safety reasons. 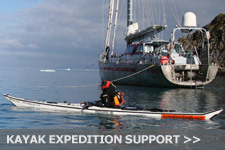 Iridium phone and VHF radio carried by the team, supplied by expedition.